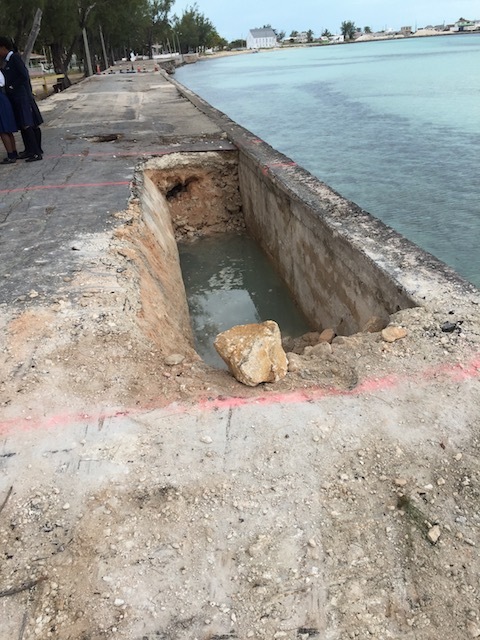 What is there that has been happening here in Eleuthera this week ? 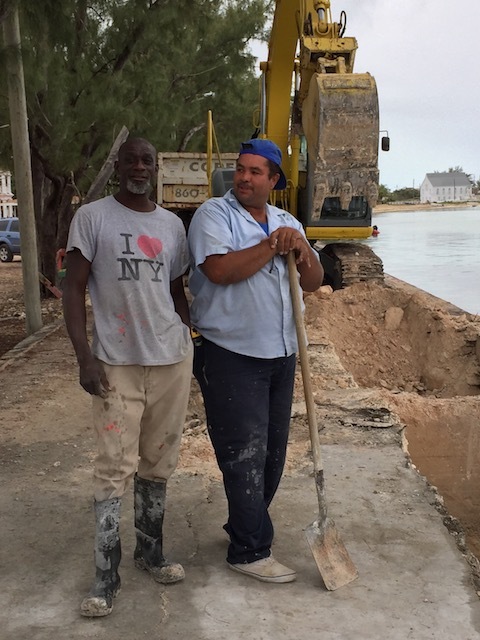 Well for a start work has started on repairing the road that runs around the harbour. The road has been out of action for a good few months now and I , like many other people, really miss enjoying the drive along the harbour edge all the way round to Cupid’s Cay. There was a hole that had appeared again and needed filling but it turned out to be a whole lot bigger problem than it first appeared. I spoke with the guys doing the work and asked them how long the road had been there and it would appear that most of the main work was done at least 50 years ago. Leading on to this ! 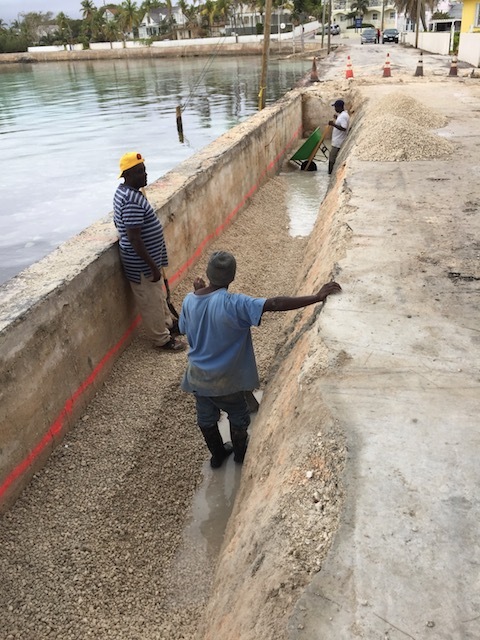 Workers on the harbour side….. The sun has been shining again and life is good. 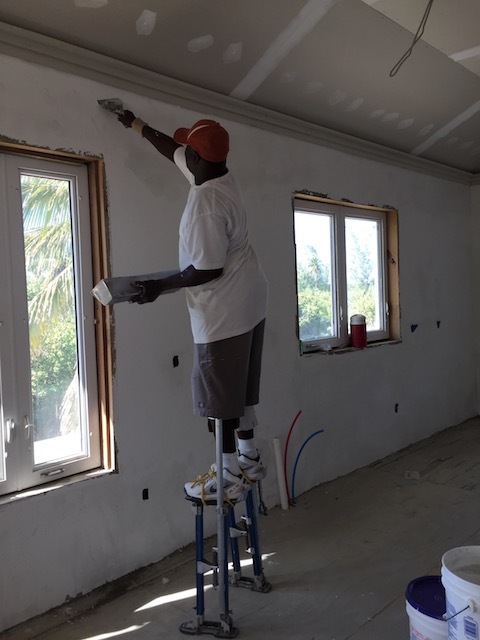 I was checking out the Anchor Point site where we are building our apartments and caught a few pictures of David plastering the walls – wearing these great stilts – I almost asked him if I could have a go …… First time I ever saw a workman with these – such a great idea – much better than having to keep moving steps around ! Well you may have noticed that this is a blog about nothing again – holes in the road, drinking on a Friday night and a man on stilts !!!!! But having made the commitment to writing every week without fail it means that of course some weeks are pretty boring – just like real life ! Anyway – we are off to Fort Lauderdale this weekend so no doubt there may be a few food pictures next week – we are going to try Cafe Boulud – one of chef Daniel Boulud’s places – and I am really looking forward to it…..
Do you think he was bored ? 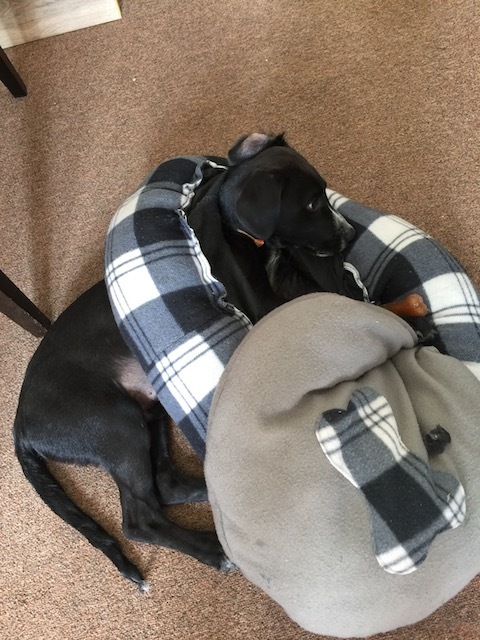 This one was taken mid November – just look at how big he is now…..
Hope you and Bob do get to Cafe Boulud. Dave and I always enjoy Bar Boulud in London, in the Mandarin Hotel. Happy travels! Yes – full report to follow ! Ah! 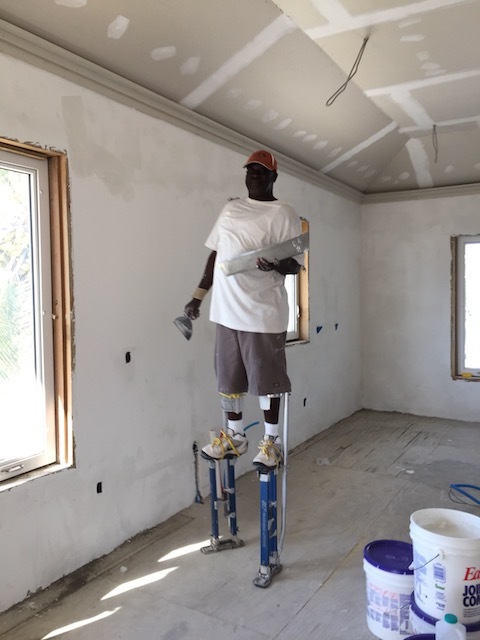 The walking man…Rather plasterer. Better than Rodin’s! Anyway, YOU are all so fortunate to NOT be here on this blizzardly day in western Massachusetts as we have well over 18 inches where drifts sifted into the walkway and it only started at 7AM. Supposed to end tonight. The birds are burning up all their calories just trying to eat seed we put out. Like Sisyphus…Covered in fifteen minutes! Enjoy Florida. What to do while we wait to clear it all? Cook up a storm and work out…Then eat. Goodness – even the sound of your weather makes me shiver ! Hope you enjoy what you cook – much like us in a hurricane ! RUDGIE!!!!! The OTHER “Destructor Puppy”! 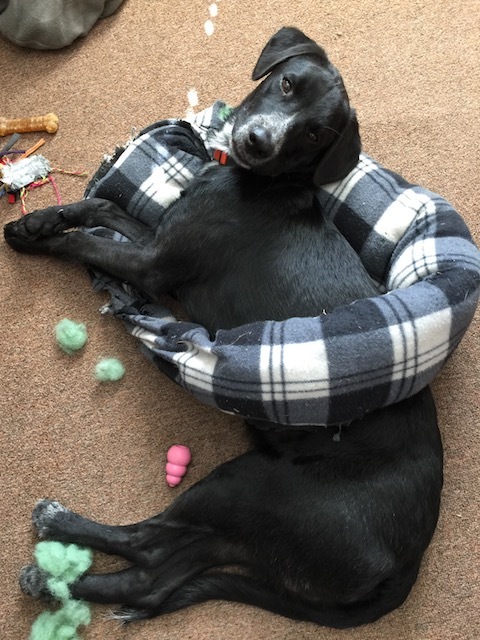 I hear Rufus is being a real rascal to Mark…..apparently there is no countertop that is sacred!…..but you can’t argue with CUTE! See you soon…..NYC is bitterly cold……ouch! Goodness I hope my saintly boy is not being led into bad habits !!!! Hope you have some warm clothing for the cold weather…..